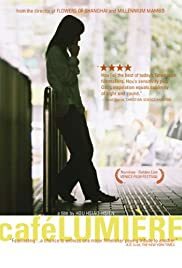 Hou Hsiao-hsien's previous film, "Millennium Mambo," was filled with pulsating colors and rhythms - "Cafe Lumiere," on the other hand, offers us classical piano music, bookshops, and trains... lots of trains. To me, the plot, and in some way the characters, seemed very fluid - you never knew where the film was leading you, and (as in many of Hou's films) it's left up to you to form your own opinion about the characters. "Cafe Lumiere" is a very languid, soothing film, filled with marvelous images and memorable vignettes. It is not a good place for a newcomer to Hou's films to start (try "Mambo" for that), and not a good film for the impatient. However, if you approach it in the right frame of mind, you will find yourself somehow transported into another person's life for a couple of hours, and come out with the film rattling around your subconscious for days afterward.